About ten species of cockroach have adapted to human environments, and thus become ‘pest’ species. The most common are the German cockroach, Blattella germanica, the American cockroach, Periplaneta americana, and the Oriental cockroach, Blatta orientalis. Their eggs are laid in a very tough protective membrane called an ootheca. This egg case is extremely durable, which is one of the reasons why cockroaches are difficult pests to combat. 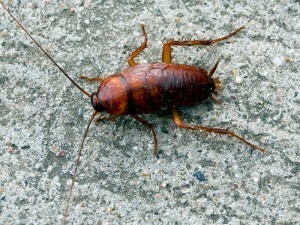 Cockroaches are an ever-present problem in residential and industrial situations, despite the range of chemical treatments available to control them. Populations often become well established before being seen, making it subsequently difficult to locate the sources and treat the problem effectively.